In May, when sun was brighter than previously, I woke up and got some images of flowers into my head. So I draw some flowers to excel and knitted colorful flower socks. 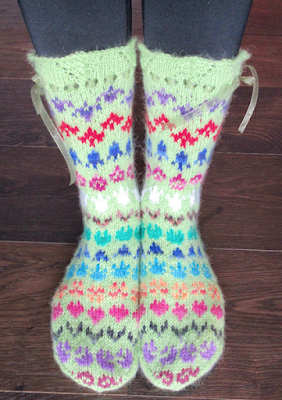 Mid-calf socks have been knitted from Novita Nalle yarns. 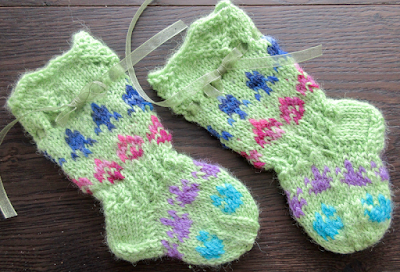 Socks were fun to knit, one flower row took only 3 g of yarn, so waste yarns can be easily used for these socks. 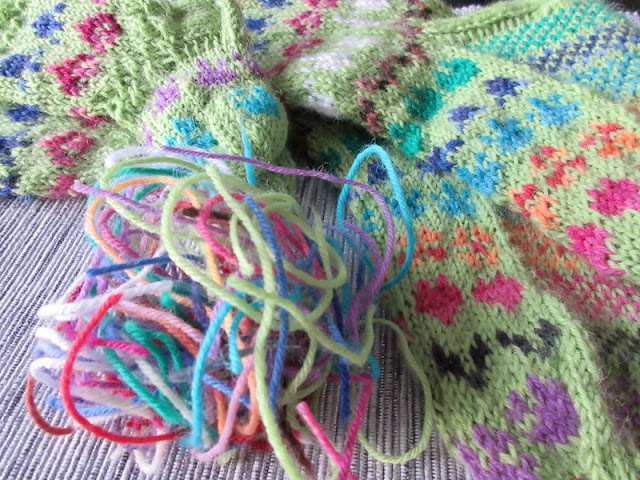 Sock begins with the lace part and holes for the braid. Socks are fitting well at least on my own 38 size feet. Leg is 20 cm long and 12,5-13 cm wide on the top and 11 cm at the ankle. Foot is 23,5 cm long ja 10 cm wide. But, but... when adult socks were ready, I wanted to knit similar to a baby. 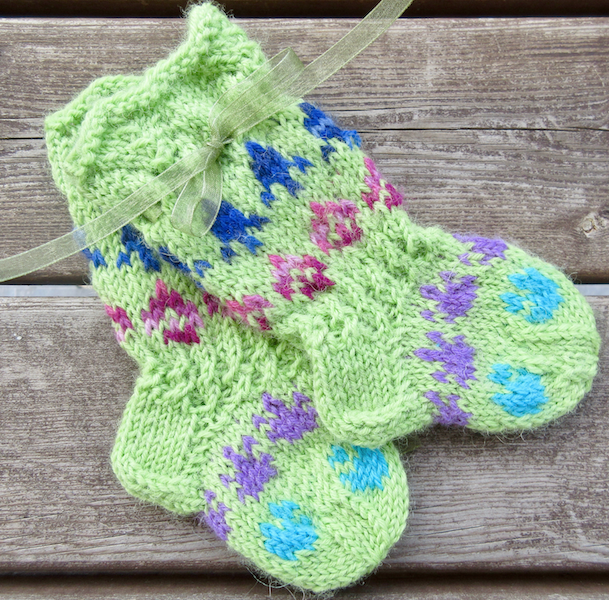 Socks are made for a baby of age 0-6 months. 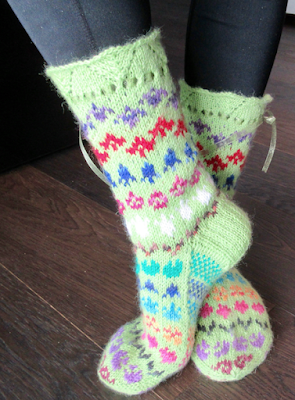 Leg is 10-11 cm long and 8 cm wide on the top and 6-7 cm at the ankle. Foot is 9,5 cm long and 6,5 cm wide. 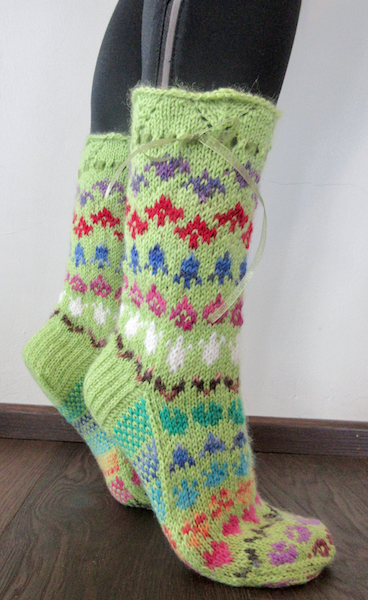 Yarn: Novita Nalle. Main color 348 and for flowers: 853, 523, 813, 857, white, 894, green, 830, 820, 865, 866, 742, 785. 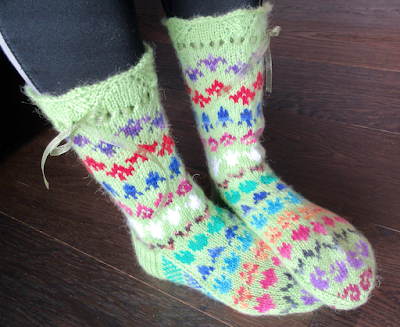 Yarn (g): For the adult socks: 70 g of main color and 36 g for flowers. For the baby socks: 22 g of main color and 6 g for flowers.